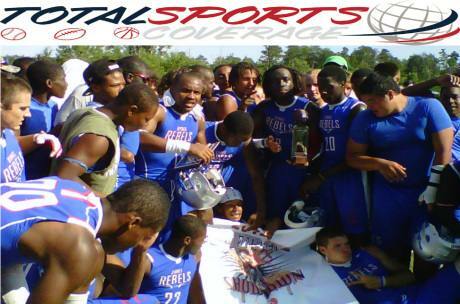 Total Sports Coverage continues to strive towards providing you with high school football from across the southeastern United States. We are pleased to announce that we will have our traditional live audio only broadcast for the North Marion (FL) Colts against the Hoover (GA) Buccaneers on tonight Thursday October 29th. North Marion will be playing its first-ever varsity football game outside of the state of Florida. Prior to this season, North Marion rarely played outside of the north central Florida area. The Colts opened their season at Blanche Ely (Pompano Beach, FL) marking the farthest south the Colts had ever played a varsity football game. North Marion is 8-0; 2-0, 2015 District 6-5A champions and have made the playoffs the last 16 seasons, the last two under second-year head coach Stephen Field. Hoover is nationally known and respected. Despite limping in to the contest winners of only 2 of its last 4, the Buccaneers are 7-2 and currently in a three-way tie for the runner-up spot in Region 3, which carries a first round home playoff game. Hoover has faced a team from Florida this season defeating 8A Manatee 42-21. Our live broadcast coverage will begin at 7pm central time with kickoff following at 7:30pm. Catch all of the action here via your desktop, laptop, phone or tablet. The North Marion Colts continue to up their marquee value. 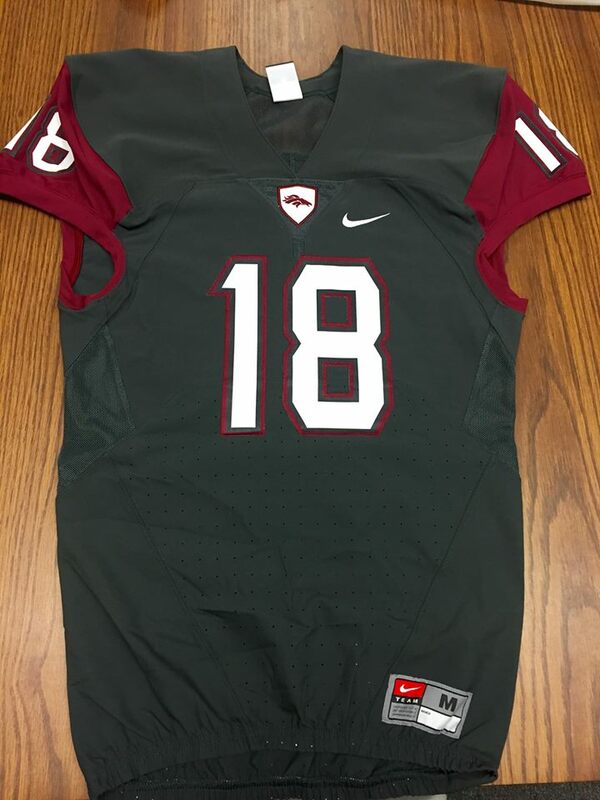 Months away from breaking in a newly upgraded football and track facility, the Colts, on Sunday revealed new threads that they will wear this fall. 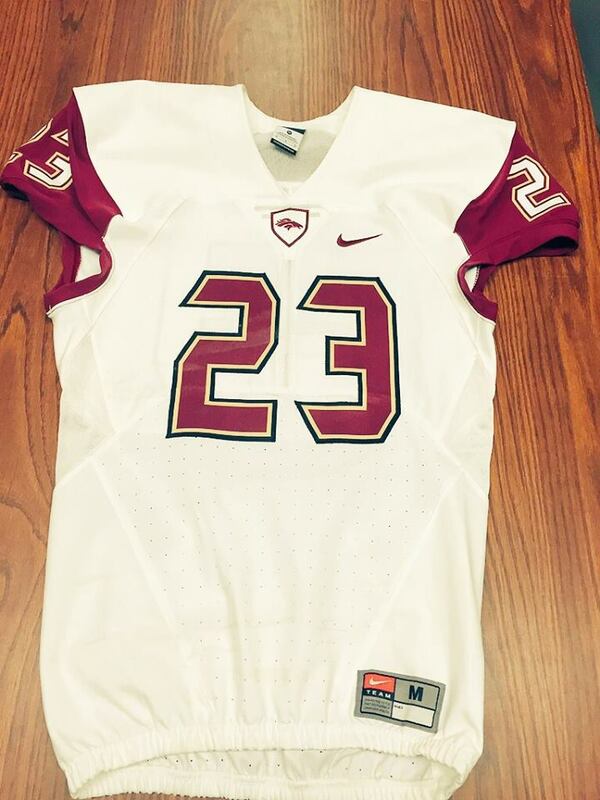 North Marion will wear Nike uniforms after previously wearing Under Armour. North Marion has made the state playoffs 15 seasons in a row and will be entering its second season under head coach Stephen Field, replacing Craig Damon now with the FHSAA. Damon was recently promoted to the position of Assistant Executive Director for Eligibility and Compliance Services. North Marion, which is in Sparr, FL despite being listed as Citra, FL nationally, will play their first-ever out-of-state game this fall when they travel to Hoover, AL to take on nationally known and respected Hoover October 30th. North Marion wide receiver Freddie Swain and Hoover defensive back PJ Hall will highlight the matchup. Both are being recruited by multiple colleges despite not being household names. Hoover is the defending Alabama 7A state champions, North Marion bowed out in the regional quarterfinals last season in Florida. The Warren Easton Eagles from New Orleans, LA made their first-ever appearance in the National Selection 7-on-7 National Championships in Hoover, Ala a memorable one. The talent-laden squad posted a 12-1 overall record, including a 6-0 mark in tournament play on Saturday, to win the National Championship. Warren Easton defeated Spanish Fort (AL)- Alabama’s Class 5A champion last season, 28-19 in the championship game. “This program has come a long way. Five or six years ago we could barely win a game and now we’re talking about winning a national tournament with a bunch of elite talent. My heart is filled with joy, we are just extremely blessed and we’re going to keep working,” Warren Easton head coach Antonio Hull said. The Eagles only loss was to defending National Select 7-on-7 champion Kenton (OH) in its second game of pool play on Friday. After that, it was all Warren Easton Eagles. 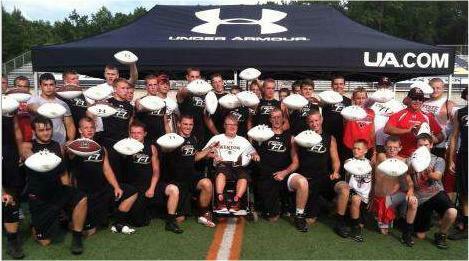 Easton did not lose again, winning their final eleven games to bring home the title. 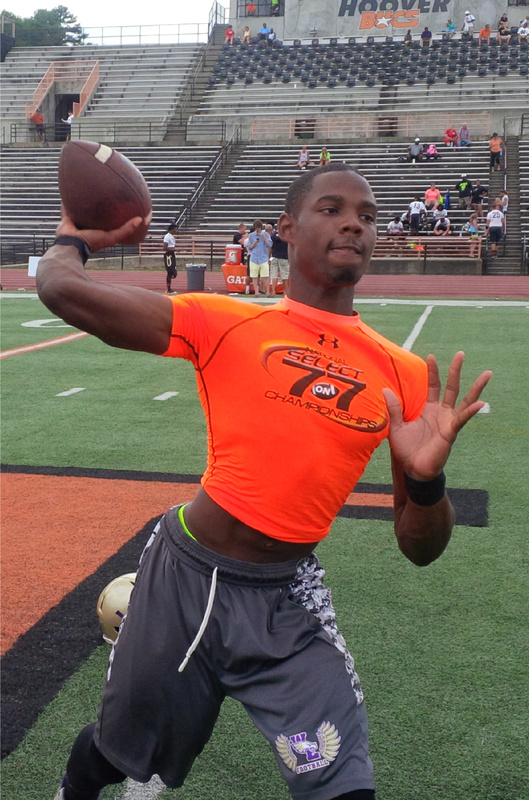 Texas A&M commit Deshawn Capers-Smith lead the way for the Eagles at quarterback. Capers-Smith had plenty of help on offense with five-star wide receiver Tryon Johnson, three-star wide receiver Darrell Clark and Tulane commit Devin Glenn on offense. Warren Easton scored 343 total points- an average of 28.5 points a game. In National Select events the defense can score however the scoring point breakdown was not available. Defensively, Warren Easton allowed a total of 197 points- an average of 16.4 per game. Tulane commit Jeremie Francis, Arthur McGinnis and Clyde Leflore anchored the defense. McGinnis and Lefolre will begin to pop up on recruiting service website by regular season’s end. The Eagles will turn their attention to the regular season where they will look to improve on a 10-4 record last season which included a trip to the quarterfinals in Louisiana’s class 4A. “We’re going to use this as a stepping stone. This is something to show them if you work hard and have a burning desire to perfect your skill good things happen,” Hull said. 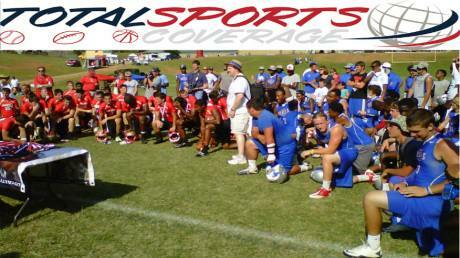 The Grayson Rams became the first team to navigate the entire loser’s bracket to win the National Select 7-on-7 Georgia Qualifier hosted by Lassiter in Marietta. 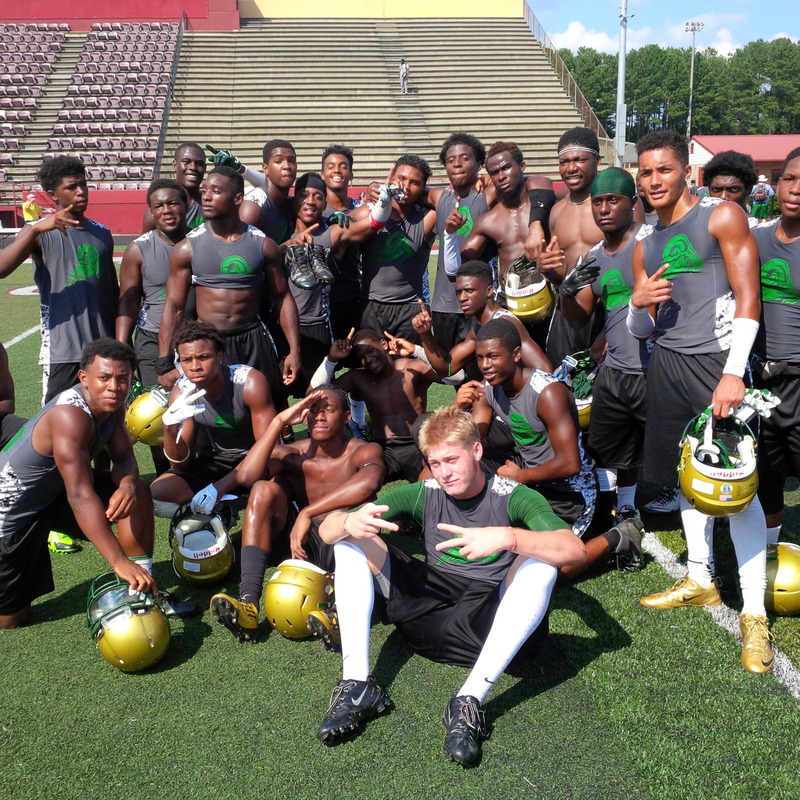 Grayson is known to make runs in 7-on-7 events in previous summers however this run stands alone by itself. Grayson entered the tournament portion of the event with a 2-1-1 pool record and drew Lovejoy in the opening round of the tournament. Lovejoy won in thrilling fashion 22-21 after scoring a touchdown with less than 10 seconds remaining to send Grayson to the loser’s bracket of the double-elimination tournament. The Rams went on to defeat Jackson County, Alpharetta (undefeated in pool play), Rabun County, Northview (undefeated in pool play), Villa Rica, North Cobb, Hillgrove and Hoover (AL) (undefeated in pool play) to advance to the championship against Valdosta. Valdosta entered the tournament with a 2-2 pool play record and won the winner’s brackets by defeating Alpharetta (undefeated at the time), Jonesboro, North Cobb and Hoover meaning Grayson had to defeated them twice to win the championship. The Rams continued to ride their momentum making a defensive stop with less than a minute remaining to win the first championship game 18-17. In the winner-take-all championship, Grayson wouldn’t need any late-game heroics as they jumped out 15-0 and never looked back, defeating Valdosta 31-9 capping the historic tournament run. Gregory along with offensive coordinator Richard Gillespie ran the Grayson team after head coach Mickey Conn left earlier to attend his son’s youth baseball game. Coming through the entire loser’s bracket is no easy feat. Teams must play back-to-back games with very little, if any rest in between. Grayson played and won seven straight games over a three and-a-half hour span from 1:00pm to 4:30pm. Gregory admitted that he was concerned with fatigue as the day wore on but turned to his seniors. Win they did. Grayson finished on a 10-game winning streak, went 12-2-1 overall and clinched a spot in the National Select 7-on-7 National Championships next week in Hoover, Al. Valdosta (7-4 overall GA Qualifier record), North Gwinnett and Lassiter will join Grayson as representatives from Georgia in Hoover next week. Valdosta was invited and accepted after finishing second at the Georgia Qualifier while North Gwinnett and Lassiter did not win a qualifying event, earned invites by hosting qualifying events. Kenton (OH) is the defending champion and was the first team from Ohio to win the National Championship last year defeating Byrnes (SC). No team from Georgia has ever won the National Championship. The McEachern Lady Indians completed a stretch of games that could easily be taken for a professional teams schedule. McEachern defeated Hoover (AL) 75-53 for their 16th victory of the season capping a five game in nine-day stretch. The Lady Indians won 16 games last season and exited in the first round of the playoffs after winning a state title in Georgia’s highest classification the previous season. Ranked No. 21 nationally after wins over Nazareth (NY) and Capitol Christian (MD) in the Rose Classic Super Jam last weekend in Brooklyn, NY, McEachern took care of their final national opponent prior to their late season region schedule that awaits in their home state of Georgia. Hoover (AL) is nationally known for its football program that has won multiple state titles in recent years, including this past 2013 season. Add the girls hoop squad to that. The Lady Buccaneers are winners of back-to-back titles in 6A Alabama and breaking in a new squad this season under head coach Tiffany Fredrick. Hoover opened up strong with a 10-0 lead in the first quarter. The Lady Buccaneers held McEachern without a point until the 1:30 mark of the first quarter and without a field goal until 21 seconds remained in the quarter. The Lady Bucs took a 10-6 lead into the second quarter and led again 11-10 after splitting a pair of free throws. It was all McEachern and Te’a Cooper after that. Cooper helped McEachern overcome their slow start by draining a three-pointer giving them a 13-11 lead they would never relinquish with 6:20 to play in the second quarter. McEachern’s fatigue showed throughout the contest yet they overcame it by using their talent, great effort and an experienced coaching staff. Cooper’s triple was part of a 23-1 McEachern run over a nine-plus minute span covering the end of the first quarter into the second quarter, sending them on their way. McEachern used it’s pressure defense to force multiple turnovers which they converted for easy baskets during the run and led 37-18 at halftime. Hoover opened the second half fighting with a quick 4-2 spurt forcing a McEachern timeout. After the timeout Caliya Robinson found Cooper for an easy layup followed up by a Taylor Gordon three-pointer and Hoover never challenged again. Cooper- who is being heavily recruited by North Carolina, led all scorers with 31 points, 6 assist and 6 steals. Sophomore Jada Lewis finished with 19 points, 4 assist, 4 steals and Taylor Gordon (Wake Forest) had 10 points, 5 assist accounting for the double-figure scorers for McEachern. Caliya Robinson continues to stuff the box score finishing with 8 points, 10 rebounds, 5 steals and 6 blocks. McEachern (16-2 overall; 9-0 region) finishes their national schedule 5-2 with wins over teams from Florida, New York and Maryland and have yet to lose a game to a Georgia team. Their losses came to Blackman (TN) and Marian Catholic (IL). Blackman (TN) is ranked No. 3 nationally. The Lady Indians were whistled for 28 fouls in the contest. McEachern is the overall No.1 ranked girls team in Georgia and will face South Cobb, Harrison and Campbell this week before closing the regular season in two weeks against Kennesaw Mountain (7-11; 2-9), Campbell and South Cobb. The Lady Indians have yet to face South Cobb (4-15; 1-10) and Campbell (15-6; 8-4) and have victories over Harrison 72-42 and Kennesaw Mountain 85-23 in region play previously this season. The Hoover Bucs had posted a few sub-par efforts the past two weeks in a 14-0 win over Minor and 28-10 win over Tuscaloosa County. In those games the “Depth Development” was used as a number of starters were held out. A home win and a road win in those games has to be huge for that depth as Hoover primes for another state playoff run in Alabama’s class 6A. Opelika came into Regions Park with a 6-3 record, a playoff berth and a shot of beating Hoover. It didn’t happen as Connor Short hit Mike Powers for a 3-yard touchdown pass to open the scoring giving Hoover a 7-0 lead. Short would lead Hoover right back into the end zone after a defensive stand, hitting Cooper Carden for a touchdown and a 14-0 Hoover lead. Short was 14-28 188 yards 2 touchdowns passing on the evening. Hoover running back Calen Campbell finished with 116 yards rushing including a 71-yard touchdown run that put the Bucs up 21-0 in the second quarter. Taylor Brown added a touchdown run in the second half while the defense recorded a safety before yielding a late Opelika touchdown for the final 30-7 margin. Hoover finishes the regular season 10-0, 6A Region 5 champions and will open the playoffs at home against Shades Valley (4-5) next Friday night. Opelika will travel to Pelham. The Grayson Rams (8-1;6-1) extended their string of shutout wins to 4-a school record with a 48-0 road win at Region 8-6A opponent Archer (6-4). The Rams scoring defense returned interceptions from Ryan Carter and Wayne Gallman for touchdowns in the victory. Grayson’s defense held Archer under 100 yards of total offense allowing only 95 yards. The nations No.1 recruit Robert Nkemdiche, Gallman, quarterback David McTier and junior Ares McCall all had touchdown runs as Grayson racked up 326 yards of total offense. Grayson will close the regular season next week on senior night hosting Brookwood. Brookwood (6-2;5-1) host South Gwinnett.